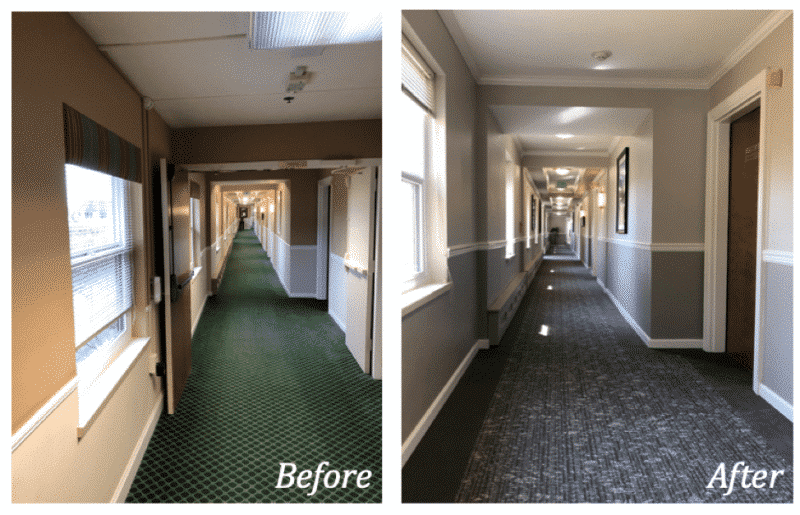 How do you make the renovation of your senior living community a success? Keeping in mind budget, timelines, goals and limitations, it’s not always a simple task. I had the opportunity to speak at the 2018 CALA conference this November, along with Michelle Brown, President of Marlo Interiors, and Cheryl Sanders, President & CEO of Interior Images, to talk about getting the most out of your renovation process. Take a look at my top recommendations on how to make renovation funds work for you and the best way to get the most out of your budget. Whether you have a budget to renovate one room at a time or the whole facility, make a plan, which will give you consistency throughout the process no matter if it takes six months or three years to complete. The plan should include an established color scheme and design style based on distinguishing your facility from the competition or if you have existing materials that you cannot afford to change (such as an existing tiled floor) that you must keep. Focus on the big picture and establish your vision! Designers with senior living facility experience will help stretch the budget and ensure that the proper senior-friendly design and décor selections are made. Rely on your Designer’s expertise for creating an impactful dynamic result within your budget. Senior living designers are well-versed in the latest trends, materials, and considerations for this demographic and can guide you in the best look for your community. Tour your community with your marketing team! Ask them to take you on the regular route that they use when they tour a family. Discuss what the negative tour comments they receive and the positive comments are. Having all this information will assist in helping to determine your renovation plan. The best starting point to design work is understanding the likes, loves, and how space will be used. Remove walls for an open environment which will provide better lines of sight and increase the amount of daylight in common areas; creating a healthier environment for residents. We all know that furniture never stays where it belongs. Residents move it, families move it, staff moves it. Periodically walk through the community and put furniture pieces back where they were intended to be. This will instantly help remove the “mismatched” look that occurs when pieces are moved; and will help your design team understand the context of the existing design. Any pieces of furniture that have extensive wear and tear and is beyond repair should be thrown away or donated. Rule of thumb: if it’s stained have it cleaned. If it’s damaged throw it away. Combining a well-balanced variety, such as changing textures, color, and patterns, resulting in an ideal use of materials that promotes visual enhancement and will make your project that much more impactful. Don’t get overwhelmed with all the different things that can go into a renovation – often times, new paint and carpet can often be one of the most budget-friendly ways to freshen up a community. A five-gallon pail of paint costs the same whether it’s white, green or gold. Used as an accent, paint can add interest and act as wayfinding for different floors or areas. Corridors particularly can be dark and dingy, but can be easily lightened up by painting the walls a lighter color and upgrading the lighting. For example, consider replacing existing wall sconces with recessed ceiling fixtures with LED lighting. Do you have an under-utilized area that can be transformed into something new? Brainstorm with your staff and Residents Counsel to understand how an existing place can become a new “destination” within the community. Good design is timeless, stay away from the trendy, short-lived ideas and you will be set. This approach makes it easier to freshen things up and achieve a different look down the road; leading both you and your renovation funds on the path to happiness! Cheers to your senior living community’s renovation and happy planning! If you have any questions on interior design for senior living, don’t hesitate to reach out!